I expect this to be painful – I have a bootable DVD and I’ll be doing a clean install with a partition format. i guess the benchmark is Fedora, but remember this is a beta. The first screen is scary – a BIOS language screen …ok and then a screen to pick a keyboard. You should pick list here. It started asking me to hit keys and I messed that all up. Maybe that black label Jim Beam is kicking in 🙂 I just aborted that and re-booted the install. The install is taking forever and this would be a good explanation…ugh almost 2 hours later and kaboom. the desktop ain’t working, stupid fonts are screwed up. Let me re-boot. Not sure what went wrong. It seemed to get WiFi setup , know where my timezone is, and all that. After a re-boot I get the same thing. I checked the forums and a suggestion was to toggle on nomodeset from F6 at the first install screen. I tried that and did the install again. Its a bit better – I can see fonts, but it is pretty obvious that the display adapter is not working right (Lenovo T60p laptop). Never had a problem with this on a Linux distro before – but hey this is beta. Strange because the login screen seems ok – it is just the main desktop environment. Well – I guess this is a beta. I can’t get it to install properly (I tried a new build from today via USB install too)- fonts are all garbled and the screen/UI is freaking out. I’ll keep at it – I’ve posted a note to the beta forum. Its probably something with my rather old machine and/or video card. Stay tuned for more on this interesting OS. Well at least I’m not a total idiot – I grabbed Mint 13, put it on a key, and had it running doing things in about 30 minutes. Not too bad. Mint’s software manager is pretty nice too – I can find most things I want and they get installed in all the right places. Graphics are good and so far the system seems pretty snappy. I grabbed Eclipse, MySQL, and apache httpd and got them running easily. Next up is getting an instance of Drupal, Tomcat, and jBoss installed and running. I’d also like to install gimp too. The software manager and update tools work well. You can find programs, get them installed, and keep them updated very easily. Such a pain in many distros. Performance – my pretty old laptop runs great. Windows are snappy, the laptop ACPI stuff is working so my hands are not burning off. GUI – I like the desktop layout, options, and colors that are OOB. I can mess around with them, but for now I’m pretty happy. There’s not a lot of super fancy features, but things feel comfortable and adequate. I don’t have to scratch my head too often wondering where stuff is or how to do it. I think anyone generally familiar with Windows or OS-X would be good to go in 5 minutes. Workspaces – pretty darn cool – and they seem to work very well. Multi-desktop options have been around for quite some time, but for some reason I find the way they work in Mint to be pretty darn cool. Just right click a window or dialog and select “move to workspace right” (or left) and the window will move to that desktop. You can get fancy and have some windows on a workspaces, always on top, etc. Then just move your pointer to the top left to see them and switch. Pretty darn cool. 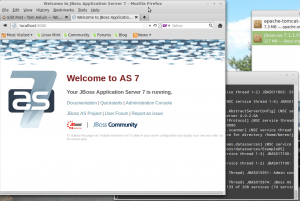 So I can have my browser up and writing this post and have jboss and eclipse up in another. As I say – not a new features, just one that IMHO finally works in a way that I actually like it. Nice job Mint! Not rocket science here. Download, extract, and run. OpenJDK is installed on the machine, but you need to know where to properly edit the startup scripts for tomcat and jBoss. I guess you can poke around or use the GUI find stuff, but its easier to just open a terminal and use this command: which java. That should find it for you in /usr/bin and then you can of course use the command: java -version to see the version info. I have OpenJDK 1.6.0_24. I’ll give this a shot and if anything funky is happening I will replace it with the “real” Java. Don’t forget that the startup scripts in jBoss 7 are new – you need to check through the standalone.conf file to ensure settings are to you liking – in particular java_opts are set here so if you want a bit more PermGenSpace this is where to do it. With that in hand you can startup jboss. Snappy! Same basic deal with tomcat. Why both? Why not – I tend to switch back and forth depending on what I’m doing. No real reason – prior to 7.1 it was mostly because tomcat was much faster to cycle, but that’s not as true with jboss 7. 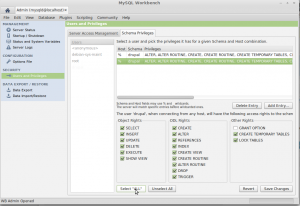 MySQL – Workbench, SQL Editors, etc. I’m not much for command line SQL crap. I’ve got a basic MySQL server running – I added this through the software manager tools. How to access it, create databases, etc. is a mystery, but you can open up a terminal and type “mysql” to get into the mysql shell and then “status” the server and you will see that its running as expected. I guess the next step is to try and login with something like MySQL Workbench or Squirrel – I’ll go with the former. I chose the Software Manager approach since I’ve had success there so far. That worked right – the icon is added under “Programming” – but its a nice day outside and my machine’s screen is not bright enough so I’ll have to put this down for today and report back. I’m going to play around with Drupal Omega on a machine that I can use outside. 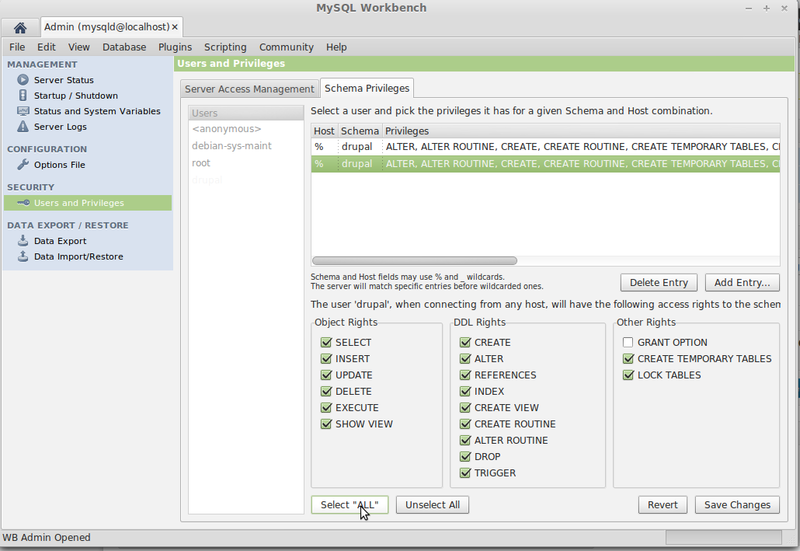 Workbench is pretty easy – create a schema (synonymous with database), create a user in the server management tools, assign rights, good to go. Next up getting php, and apache working. Pretty dang frustrating. Grrrr….I’m going to get a good ditro…trying Mint 13 next. 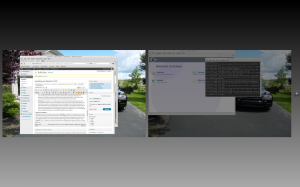 Maybe I’ll tack a review on, but Mint is kinda boring since it is just based on 12.04 ubuntu. I was thinking it also has the Cinnamon thing going so maybe if that does not work then I can say with a bit more surety that the 3D thing is a problem with this laptop. Previous story Drupal 7.15 Updating and What’s New?